DAY 01: BEGINNING OF OUR TOUR Depart Atlanta to Tel Aviv. DAY 02: INTO THE LAND OF THE BIBLE Arrive in Tel Aviv where you will be met at the airport for transfer to your hotel. Dinner and overnight in Natanya. DAY 03: CAESAREA/MEGGIDO/TIBERIAS A drive North along the Mediterranean coast will take us to Caesarea built by Herod the Great. Visit the Roman Theater and its ruins. Continue to Mt. Carmel for a visit to Elijah’s cave. Continue to Megiddo “Armageddon”, a very important strategic point on the Via Maris connecting Egypt and Damascus. 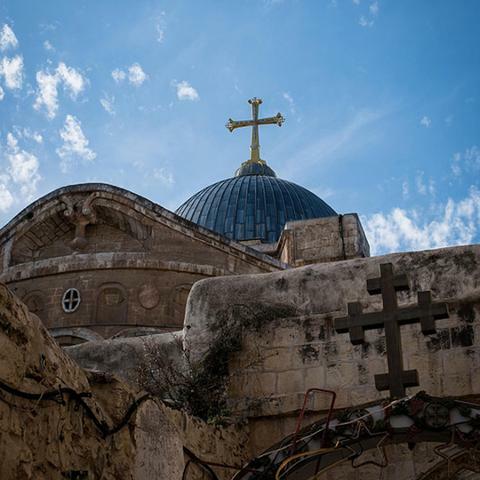 Proceed to Nazareth to visit Mary’s Well and the Church of the Annunciation. 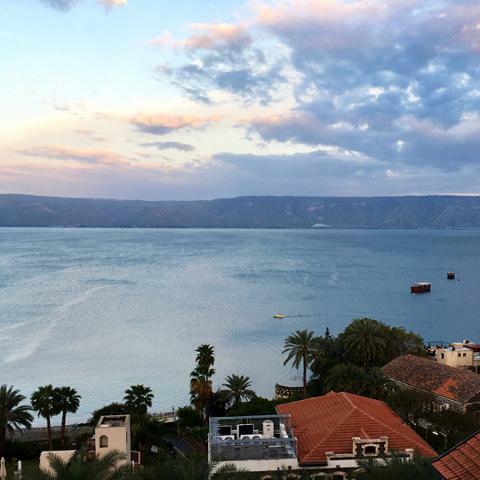 Continue to Cana for a visit to where the first miracle took place. We will also visit the ruins if Magdala, the birthplace of Mary Magdalene. Proceed to your hotel in Tiberias for dinner and overnight. DAY 04: GALILEE & UPPER GALILEE This morning board a boat on the calm surface of the Sea of Galilee, cruising toward Capernaum. Upon landing, visit the site where Jesus started His Ministry, the house of Peter and the Synagogue where Jesus was teaching. 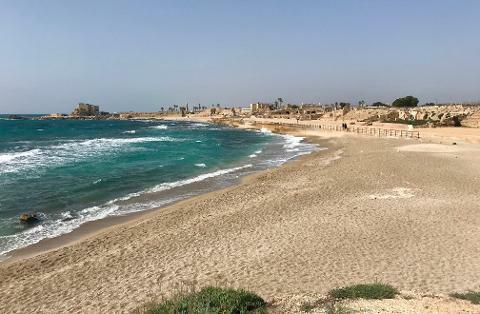 Continue to Tabgha, the site of the Multiplication of Loaves and Fish. See the 4th century mosaics. Drive to the top of the Mount of Beatitudes overlooking the Sea and surrounding area. In the afternoon drive to the Golan Heights in Upper Galilee. Visit the Sources of the Jordan River, Caesarea Philippi at Banias. Return to the exit of the Jordan River from the Sea of Galilee where a Baptismal Service will take place. Return to your hotel in Tiberias for dinner and overnight. DAY 05: ALONG THE JORDAN VALLEY/JERUSALEM Leave Tiberias and travel to Beit She’an, the leading city in the Decapolis and the place where the Philistines hung the bodies of King Saul and his sons on the city walls. Proceed along the Jordan Valley to Jericho and Tel El Sultan to see the ruins of the oldest city in the world. View Mount of Temptation, where Jesus fasted for 40 days and 40 nights. Visit En Gedi where David took refuge from Saul. Visit Elisha's Fountain before continuing on a beautiful drive that takes you along the shores of the Dead Sea. 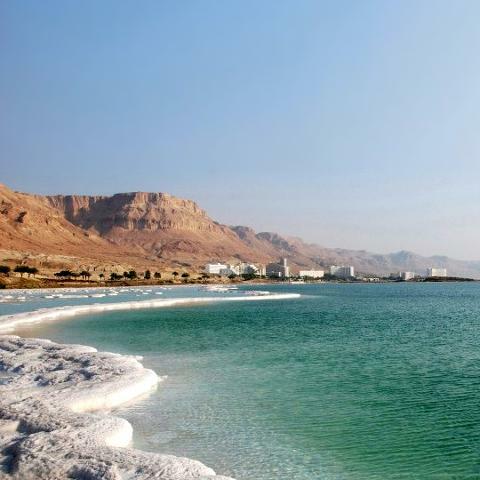 A float in the healing, mineral rich waters of the Dead Sea is part of our excursion. Proceed to Jerusalem for dinner and overnight. 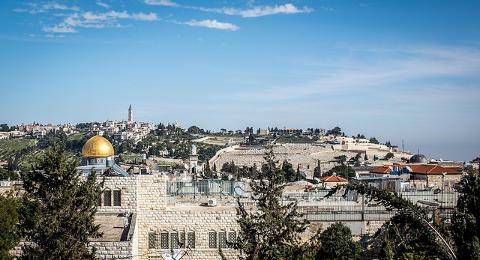 DAY 06: MOUNTAINS OF JERUSALEM/BETHLEHEM Today takes you to the Mount of Olives with its outstanding views of the city. 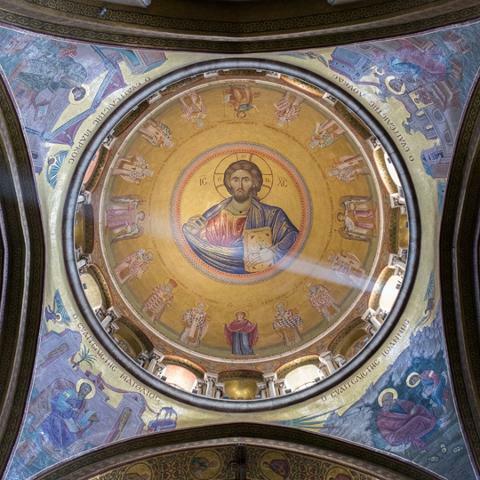 Visit the Chapel of Ascension, Church of Pater Noster, Garden of Gethsemane as well as the Church of All Nations. 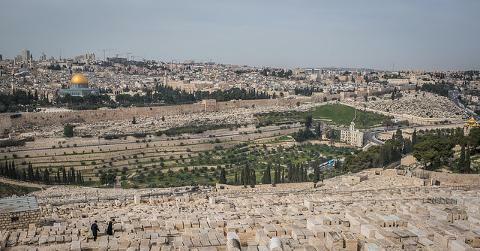 View the Kidron Valley. From here we drive South to the little town of Bethlehem with a visit to the Church of Nativity. 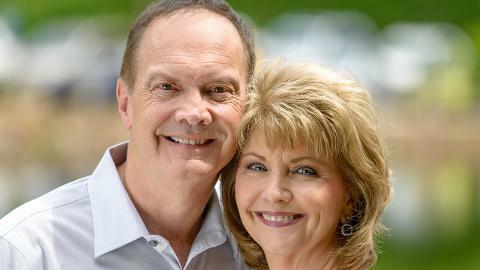 We will also go to The Shepherd's Fields and the Fields of Boaz and Ruth. We will then proceed Herodian, Herod’s mountain hideaway. 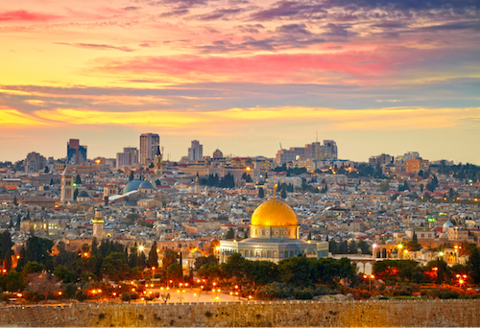 Return to your hotel in Jerusalem for dinner and overnight. DAY 07: QUMRAN/MASADA/VALLEY OF ELAH This morning we drive into the wilderness of the Judean Desert. Visit Qumran, the site where the Dead Sea Scrolls were discovered by a shepherd boy. 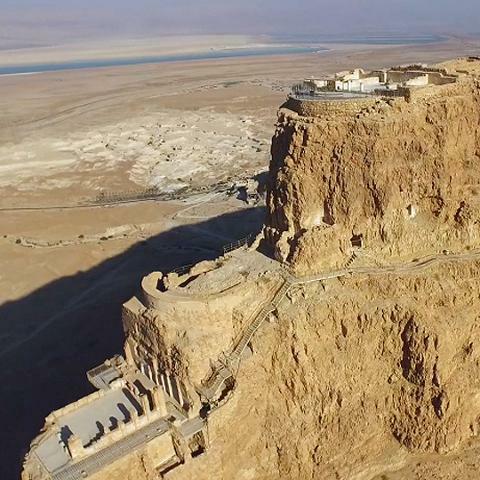 Then to Masada, a desert fortress built by Herod the Great the stronghold of Jewish zealots who committed suicide rather than surrender to the Romans. Continue to Valley of Elah, where David fought Goliath. Dinner and overnight Jerusalem. DAY 08: JERUSALEM, THE HOLY CITY Visit the Garden Tomb and Gordon's Calvary, the site where Jesus was crucified, buried, and resurrected. 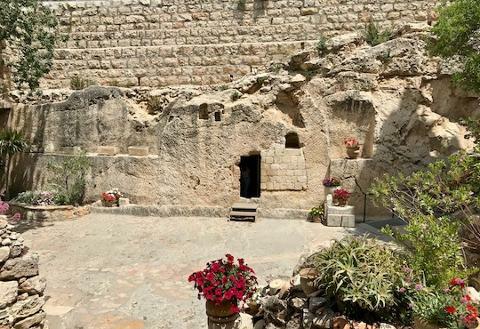 A communion service will be held at the Garden Tomb. Proceed towards the city walls built by Sulieman enclosing the most Holy sites in the world. 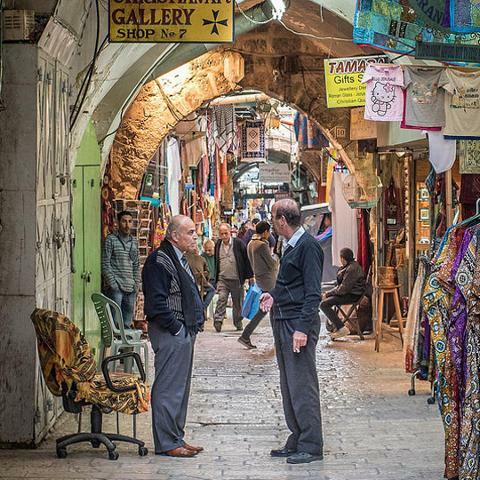 Walk into history as you enter the Old City of Jerusalem. 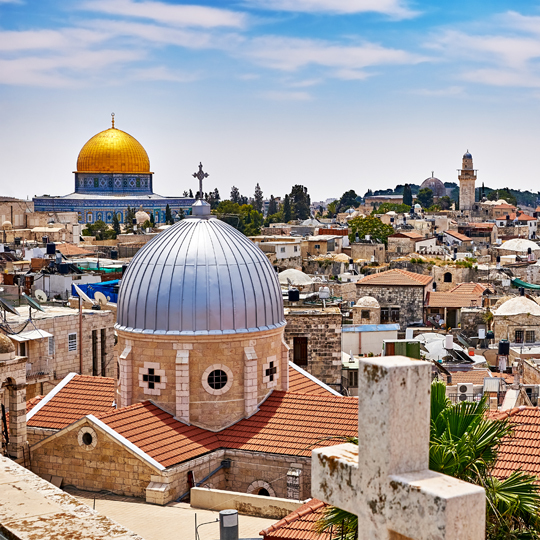 Stroll the picturesque colorful bazaars, neighborhoods and narrow streets as you make your way to the superb Temple Area, where Solomon's Temple was built on Mount Moriah. 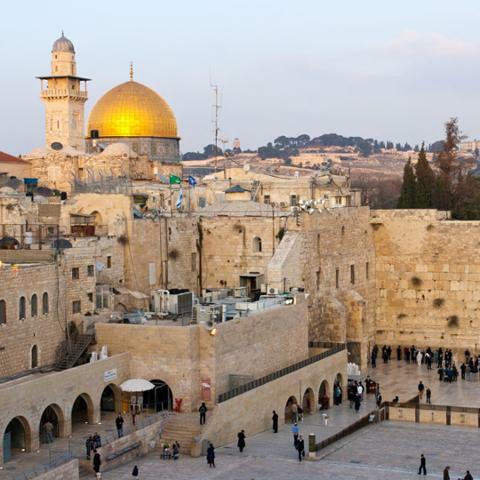 Visit the Dome of the Rock enclosing the Rock of Sacrifice; the Mosque of Al Aksa, further south, the Pinnacle of the Temple and the Western Wall or the Wailing Wall. 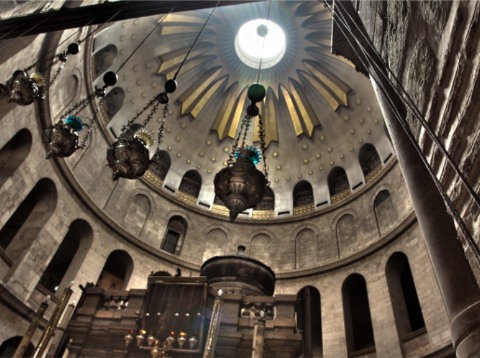 In the afternoon, start at Saint Stephen's Gate and back into the Old City to visit the Church of Saint Anne, the Pool of Bethesda, the Lithostrotos, Pilate's Judgment Hall, Antonia Fortress, as well as a walk on the Via Dolorosa leading us to the Church of the Holy Sepulchre. 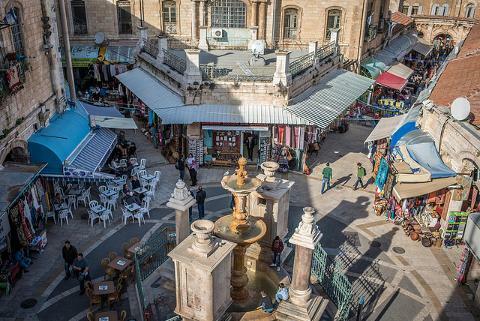 Walk through the bazaars to the Citadel and take the bus from Jaffa Gate. Dinner and overnight Jerusalem. DAY 09: NEW JERUSALEM We will begin at Mount Zion where we will visit the Upper Room of the Last Supper as well as the Tomb of King David and the House of Caiaphas. 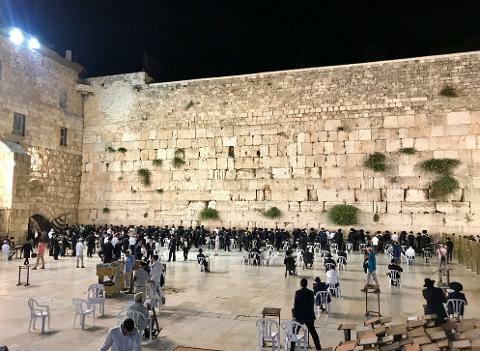 We will then go under the old city to visit the Western Wall Tunnels to see remnants from the days of the Second Temple, which was the destroyed by the Romans in 70AD. Then we will proceed to the Shrine of the Book, the home of the famous Dead Sea Scrolls. Also, you will visit the model of Jerusalem as it was laid out during the time of Christ. Spend the rest of the afternoon at leisure Dinner and overnight Jerusalem. 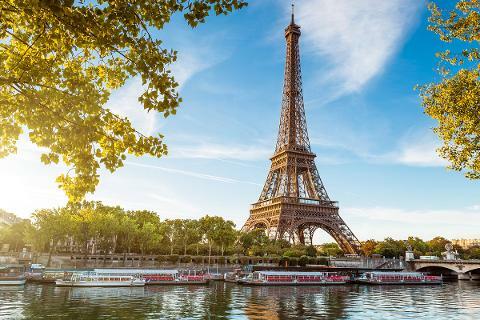 Day 1: EXTENDED TOUR Arrive in Paris where you will be met at the airport for transfer to Novotel Tour Eiffel Hotel. Dinner and overnight Paris. Day 2: PARIS Breakfast at Hotel. Full day sightseeing in Paris with English speaking tour guide. We will visit Notre Dame Cathedral, Place de la Concorde, view of avenue Champs-Elysees. Lunch on your own arrangement. We begin the afternoon at the world-renowned Louvre Museum. See the Mona Lisa and other famous works of art. Dinner and overnight at hotel in Paris. Day 3: PARIS Breakfast at Hotel. Today we will visit the Latin quarters in Paris. We will see the famous Eiffel Tower. Lunch on your own arrangement. Spend the rest of the afternoon at leisure. Dinner and overnight in Paris. Day 4: NORMANDY Breakfast at the hotel. Full day tour by train to Normandy, France. We will take a high-speed train to Bayeux, France. From there a bus will take us to Omaha Beach, the most famous of the D-Day landing beaches and was the scene of the bloodiest battle of World War II. We will visit the American Cemetery containing more than 9,000 perfectly aligned gravestones. Nearby, we will visit the Overlord Museum which chronicles the history of the Allied landings and the liberation of France. We will take the evening train back to Paris. Dinner and overnight in Paris. Day 5: Breakfast at hotel. Transfer to Paris airport for return flight home. NOTE: All sights will be visited. Schedule is subject to change due to various factors and tour guide’s discretion. $4,895 based on double occupancy. Book now as space is limited.